More than 30,000 people in low-lying coastal areas have been urged to evacuate their homes ahead of powerful Cyclone Debbie, as it bears down on the Queensland coast in northeastern Australia. 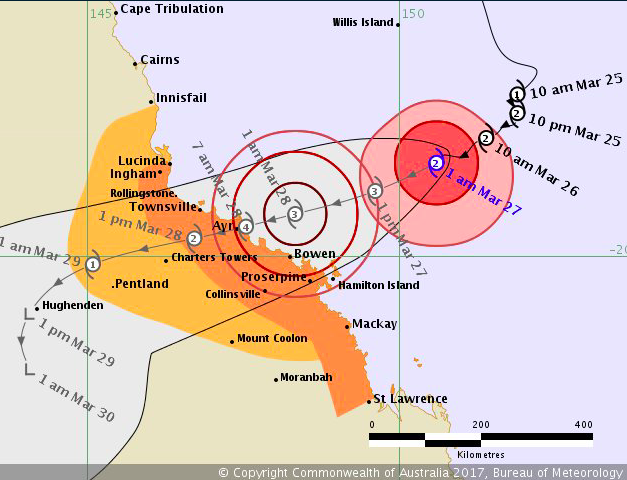 With landfall expected early Tuesday, Cyclone Debbie is currently a Category 4 storm and could intensify to Category 5. A Category 4 storm on the Australian scale equates to wind gusts of more than 140 miles per hour, the New York Times said. Storm surge poses the biggest threat as the cyclone strengthens, according to major weather forecasters and news outlets. The Sydney Morning Herald: Cyclone Yasi, which struck north Queensland in 2011, powered a storm surge that reached 7.5 metres between Cardwell and Tully Heads, akin to a tsunami, said David King, the director of the Centre for Disaster Studies at James Cook University in Townsville. The New York Times: “People living in coastal or low-lying areas prone to flooding should follow the advice of local emergency services and relocate while there is time,” said Bruce Gunn, the regional director of Queensland’s bureau of meteorology. The warnings are a good reminder that while we may think of destructive winds as the biggest danger in a cyclone or hurricane, storm surge is often more deadly. Here in the U.S. the National Oceanic and Atmospheric Administration this hurricane season will use a storm surge watch/warning system to highlight areas along the Gulf and Atlantic coasts that are at risk of life-threatening inundation. The new tool will alert residents to the risks of rising water and the need to evacuate, the Tampa Bay blog said. A 2016 updated study by CoreLogic found that more than 6.8 million homes located along both the Gulf and Atlantic coasts of the United States are at risk of damage caused by hurricane-driven storm surge flooding. More on storm surge risk via the Insurance Information Institute facts and statistics on flood insurance.